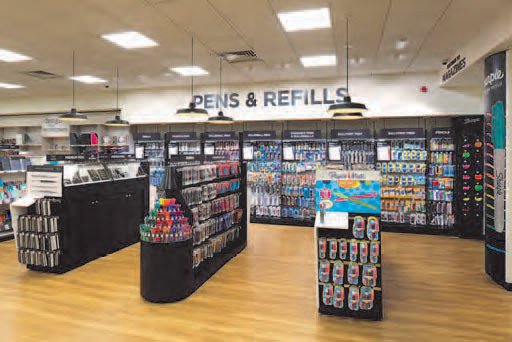 ARNO were challenged by WHSmith to create a more personalised solution to attract consumers shopping for writing instruments in the pen department. Using a mix of quality materials made to work with existing instore displays, ARNO developed, manufactured and installed a new concept by categorising the pen department to stand out in store. The new department colour scheme gives the area its own identity within a very busy multi category store. The new concept differentiates the premium writing instruments from the standard pens making it easier and faster to shop for consumers. Consultants will be at hand to assist on premium pens where there is a retractable writing drawer which gives the opportunity for shoppers to trial the writing instruments. All the other products can easily be tried by consumers to strengthen the customer engagement. Storage and security has also been added to help in-store staff during busy opening hours. More than 20 stores have been installed, with many more in the pipeline. Sales have been exceptionally strong and have helped to keep WHSmith as the number one retailer for stationery.